This is one of the famous street foods in Hyderabad. Once, I happened to eat this & just tried at home it in my style. From that day this is one of my husband’s favorite dish. Hope you like it too. So, next time don’t worry about left over idlys. It can serve as an evening snack. Melt 2-3 tsp of butter in a cooking pan. Add finely chopped onions to it & cook till golden brown. Now add salt, chilly powder, coriander powder and cumin powder. Stir for a minute. Add coriander leaves and mix well. Empty the contents into a bowl. In the same pan, add 2 more tsps of butter & place 3-4 idlys at a time. Roast for some time on a medium flame. Take care not to burn them. Turn to the other side and cook similarly. Spread the onions mix on the cooked side of the idly. Keep until the lower side of idlys is cooked. 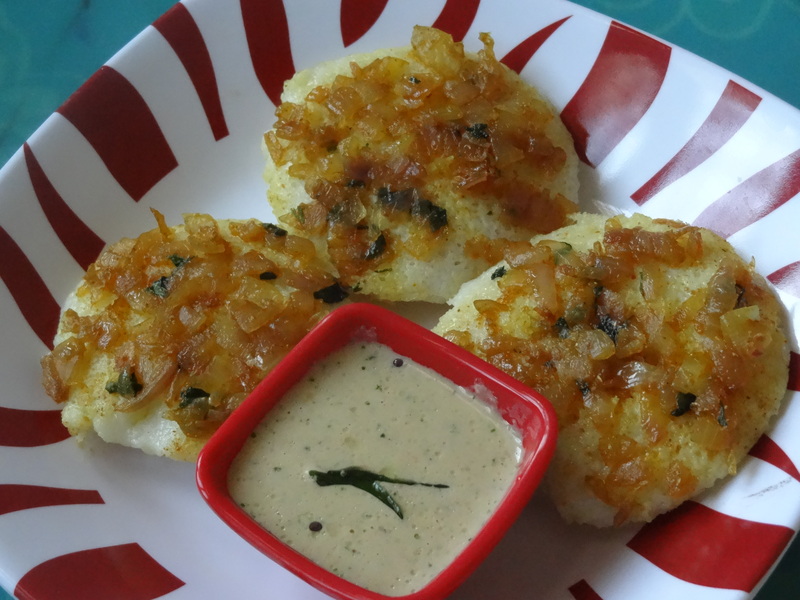 Serve immediately with coconut chutney or peanut chutney.